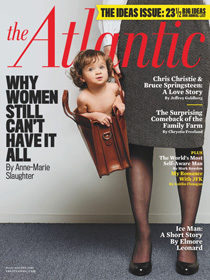 I've hesitated to weigh in on the "having it all" debate, re-sparked once again by Anne-Marie Slaughter's much-discussed Atlantic cover story last month. In part, I was reluctant because I find this debate a big distraction from the more important questions about why our work environments are still so ‘unfriendly’ and inflexible for working parents, especially mothers. For many, it feels as if our options become to take an early exit from the fast track or feel guilty about the times work interferes with parenting and guilty for the parenting times missed because of a workplace still not flexible enough to accommodate parental needs. We need policy answers that address those questions more than we need to debate our choice as "having it all" or "settling for less." After all, there are millions of working women who don’t have the luxury of even asking the question about whether they can "have it all," because they are already DOING IT ALL. For them, there is no debate, because there is no other option but to work too long, too hard, all the while trying to be the best parents they can. A debate about balance for a woman who has to keep going, even if she is carrying babies, debt, briefcases, and guilt is only adding to her burdens. The truth is when we frame our options in the ways sometimes framed by smart and high profile women making the case for their personal decisions and choices, we not only seem to be passing judgment on other women’s choices, but also we give rise to judgments about whether women are worth the investments of graduate school education, corporate recruitment, and advancement. The result of some of these high profile departures is a growing reluctance on the part of big companies to invest in women as potential leaders. Wouldn’t it be better for them and other women if they stayed and pushed for more family friendly policies in their companies, like mandated family leave and flex time? We also ignore the choice more women than ever are making to become entrepreneurs and create their own work environments and schedules. That’s one way that more women are defining having it all--even though making it as an entrepreneur is never without other challenges. I would prefer that we have less of the "having it all” debate, and focus instead on identifying ways to expand and improve our options: how can we ensure that women's leadership is cultivated and sustained in every sector and what can we do to motivate women leaders to be different kinds of leaders once they get to the top? It’s especially disappointing when women CEO’s don’t make the concerns of working women a top priority in setting their policies. What kinds of structural changes must we make to ensure that working parents can be there for their kids and excel at their jobs? There are better models on family friendly policies in many other countries. The truth is, the U.S. has done little to support the needs of working women and that’s probably why the debate is probably hottest here. But if Lily were doing that play today, I would suggest she add a line to provide another option: doing more to ensure that women, all women, can have what they want and need.